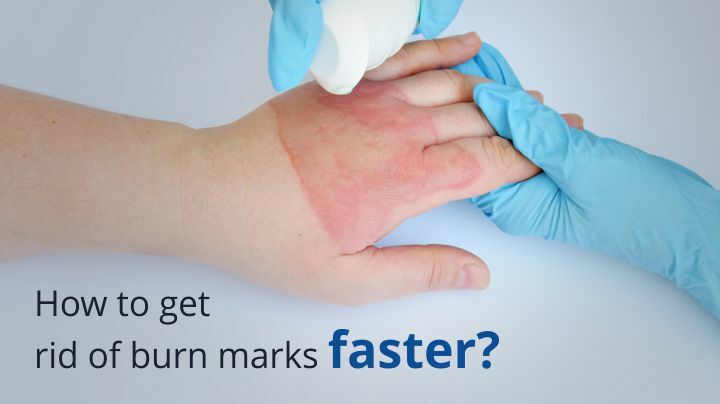 You Are Here: Home » Dr. Dhepe » How To Get Rid Of Burn Marks Faster? How To Get Rid Of Burn Marks Faster? While this statement is highly motivational, the irony is that no one would want anything to leave a mark on their skin. Burn scars are not just a mark on your body but on your mind. Burn scars can be raised, depressed or stretched. They can be either single or multiple. Some scars can cause pain thus requiring treatment, apart from that; treatment offered would be to improve aesthetics. So, when you hear the question ‘how to get rid of burn marks’, you realize that enduring everyday life without it leaving a scar is harder than it sounds. Any wound or injury, and especially burns can leave a lasting mark on your skin, in the form of a scar. It is known as a residual mark caused by the healing of a deep wound, and this applies to burn scars as well. When collagen hastily covers a wound, the neat lattice structure of the cover is not always maintained. This forms the characteristic lumps or deep indents that usually show on the skin. After 6 months, the mature collagen becomes firm and abnormally hard and the scars tend to get progressively worse after this period. Initiating treatment as early as possible is the best way to improve the appearance of the scars. At Skin City, we have a range of treatments that can reduce the appearance of scar tissue. Depending on the type and age of a scar, a variety of different treatments may help make them less visible and improve their appearance. Burn scars often grow and thicken and are called hypertrophic scars. To prevent hypertrophy from occurring, pressure garments and silicone gel sheets are used to prevent the growth of the scar. Silicone gels stops fibroblast proliferation and help in collagen remodeling. Burn scars can also be reduced in size by diminishing the blood supply to them. Vascular lasers like DYE-VL, target the vascularity of the scar, thereby shrinking it. Large hypertrophic burn scars can be reduced with the help of Ultrapulse SCAAR Fx laser. Collagen remodeling can be induced with the help of latest and powerful Enerjet JVR technology, which disperses the darkened scar tissue which is up to 1000 times its size. Here active ingredients or drugs are delivered into the scar tissue uniformly using fractional lasers. The lasers create micro channels through which the drug enters the tissue consistently and causes shrinkage of the scars. The procedure used to treat you will depend on the cause and appearance of your scar and what our skin super specialists believe will get you the best results. We use a combination of skin regeneration procedures to reduce the appearance of scars. During your initial consultation, you will discuss your concerns about the scars with the Consultant. The consultant will assess the type of scar and the site, and then advise you of the different treatment options available. We will then create a personalized treatment plan once the facts are fully understood. Find out more about the procedure and recovery at www.skincityindia.com and if you would like to arrange a private consultation with one of our skincare specialists then please call us to schedule your appointment. Don’t delay any further! Take action today.